Editor’s note: Additional context regarding tuition deregulation has been added to the story. With week one of the 86th Legislative Session in the books, many Texans are wondering: What’s happening with higher education? And how will the flagship university be impacted? Before you read any further, check out our story on higher education funding for this session. Once you’ve prepped yourself with the fascinating history of higher-ed funding, there’s an important concept that deserves a much deeper dive, namely net tuition. This is critical for understanding the affordability of a degree from The University of Texas at Austin. Net tuition is the average cost Texans pay for higher education after financial aid is factored in—around $5,000. At UT Austin, for example, the cost of delivering high-quality education for a single student per year is about $33,500 to the university. The average Texas resident pays about $5,000 in net tuition. So, even if the “sticker price” of tuition goes up, as it did by 3.1 percent in 2016 and 3 percent per semester in 2017, and 2 percent for the next two academic years, the actual cost is almost identical to the cost more than a decade ago, and in some cases, like 2016 vs. 2005, actually cheaper after inflation. 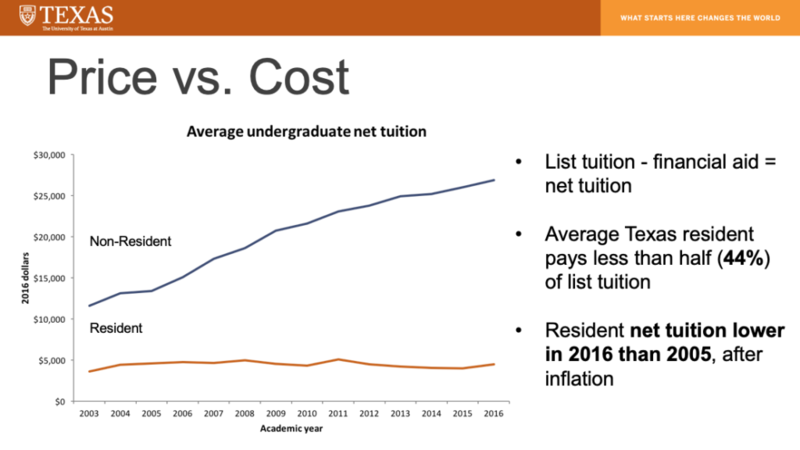 Tuition at UT and other universities around the state rose after deregulation, but Bird says, that in the last decade, UT Austin has seen only modest tuition increases. “We had five years with no tuition raises,” he says. The university also keeps net tuition down through extending the number of students eligible for financial aid. In recent years, UT has expanded financial aid to lower- and middle-income students. This was partially funded with an increased allocation to UT Austin from the Available University Fund. UT took a $5 million chunk and applied it to funding financial aid, which in turn, brings down net tuition on average. In April of 2018, UT announced that students whose families earned less than $30,000 annually would receive enough money to cover four years of tuition. Additionally, grants between $300 and $2,500 have been made available to students whose families earn up to $100,00. And roughly 60 percent of all undergraduate students receive some form of financial aid. “It demonstrates what good stewards we’ve been with public and private money,” Bird says. As you can see in the above graph, out-of-state tuition is markedly higher than in-state tuition, and theoretically can subsidize tuition for Texans. However, because UT Austin is comprised of 90 percent in-state undergraduate students, the number of out-of-state students paying higher tuition is relatively small. 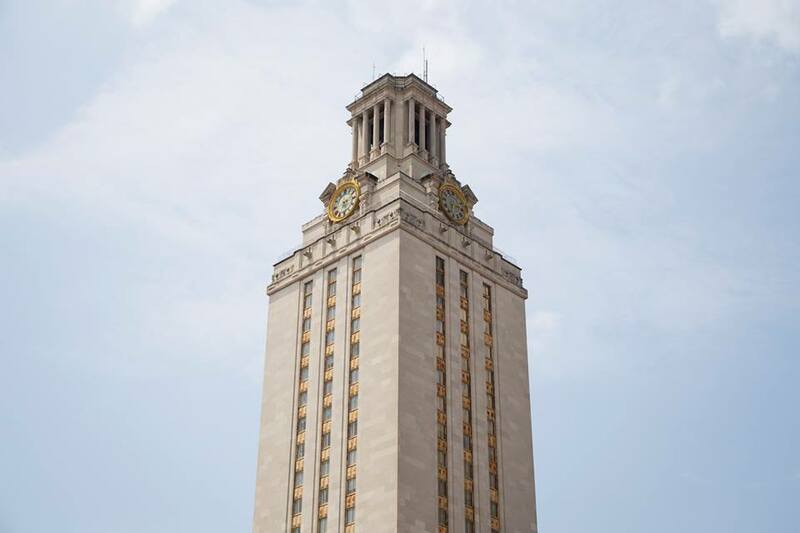 For in-state students, UT Austin compares favorably to other Texas schools. That number translates nationally as well. Editor’s note: The Texas Exes takes a position on issues that directly affect students and professors on the Forty Acres. To read more about our advocacy efforts, click here.